* Beryl Technologies provides 5 different recording outputs from the BT 2000 Wireless Smoke Meter, always verify with your local regulators to determine which outputs are acceptable for your regulatory record keeping. PC Software "BTLink" is available from Beryl, custom certificate template is option available from Beryl, Signature pad are commercially available off the self. Adobe Acrobat Pro is available from Adobe. Options 1 and 2 may require internal IT support and a Beryl cloud subscription service. (Contact us for Details). The data for this file was downloaded from the BT 2000 smoke meter and saved to the PC with BTLink software. Note 1: BT Link PC Download software is only compatible with 32-bit or 64-bit Windows 7 and Windows 8 Operating Systems with latest software updates and hardware with available USB Port. Extra service charges may apply, if Computer assistance is needed and computer operating systems is not completely up to date. 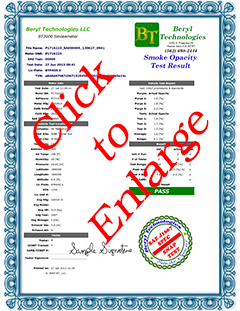 The data for this certificate was downloaded from the BT 2000 smoke meter and saved to the PC with BTLink software. The stored test was then converted to a certificate, digitally signed and saved as a verified PDF file. Requires optional Beryl's PC download software "BTLink", a custom certificate template, and signature pad. Digital verified signature PDF file is saved with Adobe Acrobat Pro. Once the smoke test are downloaded, certificate and digital verified signature can be added quickly. Note: Always verify with your local regulators to determine which outputs are acceptable for your regulatory record keeping. PDF is best viewed in Adobe Reader. 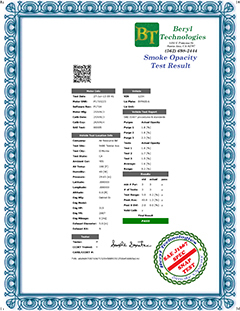 The initial data for this certificate was downloaded from the BT 2000 smoke meter and saved in the BT Cloud service. The data was then downloaded from the BT Cloud to the PC with an internet browser. The smoke test was then converted to a certificate, digitally signed and saved as a verified PDF file. Requires optional Beryl's BT Cloud service, BTLink PC download software "BTLink", a custom certificate template, and signature pad. Digital verified signature PDF file is saved with Adobe Acrobat Pro. Once the smoke test are downloaded, certificate and digital verified signature can be added quickly. Note: Always verify with your local regulators to determine which outputs are acceptable for your regulatory record keeping. PDF is best viewed in Adobe Reader. Copyright © 2009-2017 Beryl Technologies, LLC. All Rights Reserved. Note: After all smoke tests, always print a test hard copy. 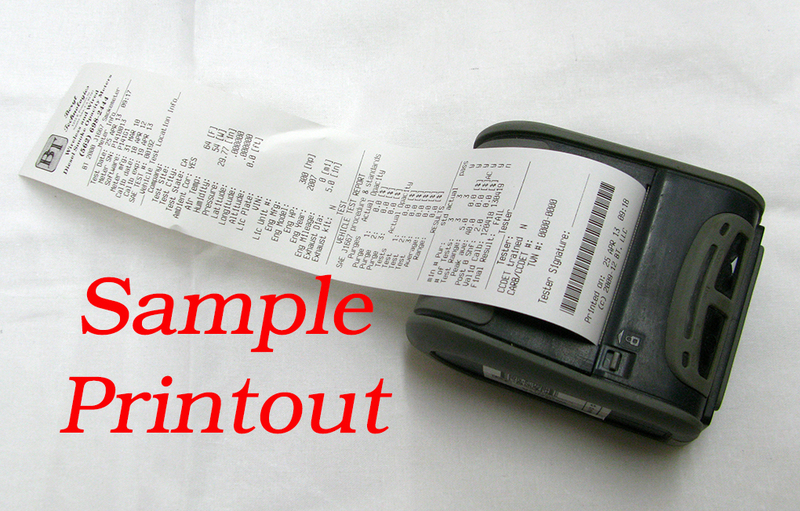 Always, verify that all data items were properly inputted and correctly printed. Download the data from the meter after each test or at the end of the day. We recommend downloading the data at the end of each day, and verifying that all smoke tests performed during the day were added to smoke test data base. Always use a secure and redundant backup system for test data storage. Beryl Technologies will not be liable for any lost or corrupted data.